Easy to make spiral hair wrap. Polymer Clay Spiral Hair Wraps – Today I’m excited to show you how to make these flexible, removable polymer clay spiral hair wraps. These are ridiculously fast and easy to make. From the moment I decided to try to make these until they were ready to use was about 30 minutes. They’re so easy to make, kids can pretty much make them their selves. There’s a back story about how these came to be actually. About a year ago my mother-in-law went to Seattle and found some sweet spiral hair wraps to give to Noelle. Noelle’s worn them but honestly I never really looked at them too closely. Then a number of weeks ago I went on a girls trip to Seattle and while we were at Pike’s Market my girlfriend found similar hair wraps for her daughter. When she showed me what she bought, she suggested I should try to figure out how to make them. So when I got home I took a look at Noelle’s hair wraps and I decided to give it a try. What do you know…these spiral hair wraps were super quick easy to make. Polymer clay in various colors (Sculpy, Premo, Fimo, etc.) – or if you just want, you can just use one color. Apparently Sculpey has a Superflex Bake & Bend clay that would be perfect for this is you can find it. Choose 2-4 colors of clay and knead the clay until it’s soft and then roll the clay into little logs. Take all the logs and twist them together. Roll on a smooth flat surface. Fold over and twist again. Roll on a smooth flat surface. Keep doing this until you’re happy with the design. *Be careful not to do it too many times or it will all just turn into one color – likely grey or brown. Roll the clay smooth and until it’s about the 1/8″ in width (smaller than this will mean the spiral hair wrap will easily break) and about 12″ long (although you can make these any length you desire). Feel free to roll in a bit of glitter too if you’d like to make these extra fancy. Carefully start winding the clay around the skewer until you’ve wrapped it completely (see photo at bottom of post for example). If you’d like to add beads, etc. you can pinch one end into a little loop, otherwise, leave plain. Once you’re happy with the spiral, gently release it from the skewer and slide the clay off and onto the foil lined cookie sheet. Cook in the oven at the temperatures listed as per the clay’s instructions (mine cooked in the oven at 275 degrees °F for approximately 15 minutes). Here’s a great chart of cooking times for the various brands of polymer clays. Take out of oven, allow to cool. Using a small section of hair, about the thickness of a straw, give the hair a little twist. Place the section of hair in the first channel of the spiral wrap and with one hand pinch the hair against the wrap and with the other hand begin wrapping the hair counter clockwise into each channel all the way down the shaft of the spiral wrap. Once the section of hair is in place, check to make sure it is in place by giving a little tug. If the wrap slides then redo with slightly more hair. To remove: Carefully unwind the hair section from the wrap. NOTE: these are relatively durable but be careful not to just try pulling this out of your hair in one big yank, this will snap the hair wrap. Please do not twist or bend them excessively as this will also cause them to break. These are slightly flexible but it’s best to treat them gently. 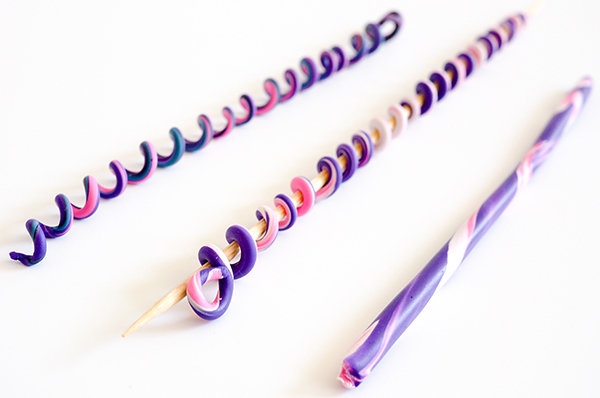 Download your printable Polymer Clay Spiral Hair Wrap instructions here.